Print: 6 x 9 x.5 inches, With Display Base: 6.5 x 9.75 x 2 inches. 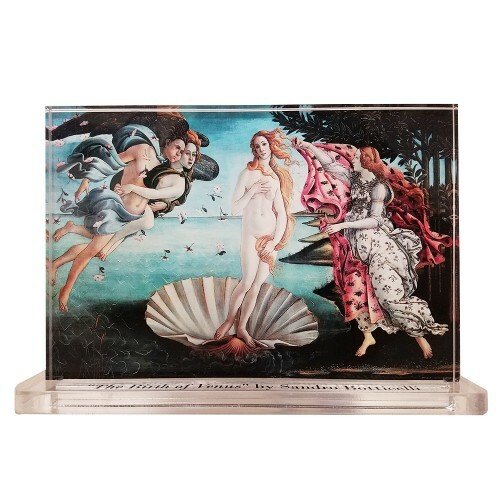 Our clear acrylic display of Sandro Botticelli -- Birth of Venus. All acrylic displays come in two pieces: a printed base with the artists name and title of their famous painting, and printed artwork on half inch clear acrylic. Items are printed and produced to order. Printing and processing takes up to 5 business days plus shipping time to your location. Masters Behind the Glass are NOT printed on glass but gives the illusion of glass.The Birth of Venus (Italian: Nascita di Venere [?na? ?ita di ?v? ?nere]) is a painting by Sandro Botticelli probably made in the mid 1480s. It depicts the goddess Venus arriving at the shore after her birth, when she had emerged from the sea fully-grown (called Venus Anadyomene and often depicted in art). The painting is in the Uffizi Gallery in Florence, Italy.